Wash and dry produce. Heat a small pot of salted water to boiling on high. While heating, peel beets. Cut in half then slice into half inch pieces. Add to the boiling water and cook for 18 minutes. Peel carrots, halve lengthwise, cut into 2 inch long pieces on an angle, set aside. Peel and mince garlic, set aside. Zest lemon and set aside 2 tsp. Juice the lemon and put juice in a bowl with the chopped onion. 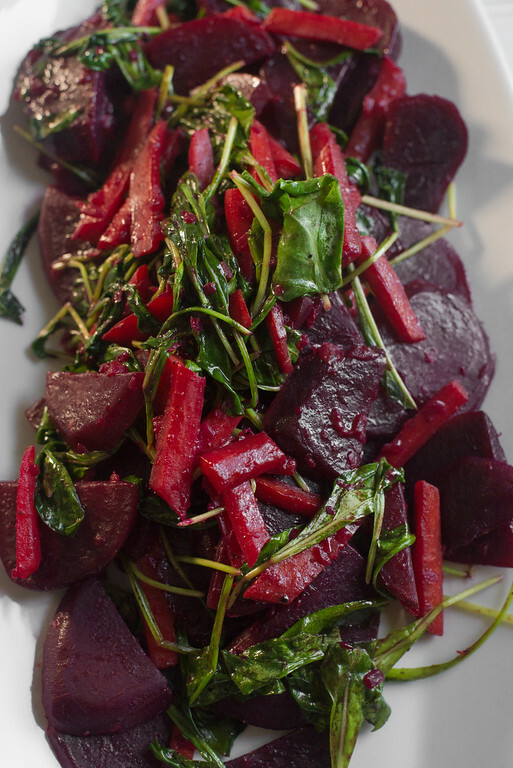 Once beets are cooked and drained, add them to the lemon juice mixture and toss. Season with salt and pepper and allow to marinate for at least 5 minutes. While beets are cooking, heat oil in a medium pan. Add the carrots and cook, stirring frequently 4-6 minutes until lightly browned. Add ¼ c water, season with salt and pepper, and keep stirring until carrots soften and water cooks out. Add butter and garlic, allow garlic to cook. Add lemon zest, marinated beets including the marinade liquid and cook a few more minutes. Remove from heat, toss with fresh arugula and serve right away.